Alien Bernard Hopkins does it again! 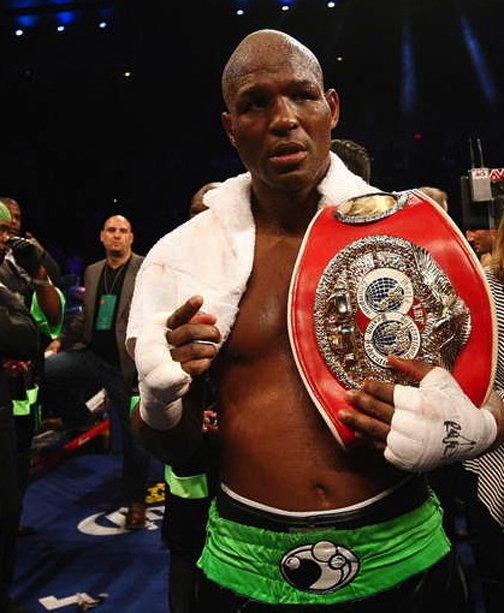 ATLANTIC CITY, N.J. — Retiring his “The Executioner” nickname in favor of the “The Alien,” Bernard Hopkins tried to give Karo Murat a close encounter of the knockout kind. With his first KO in almost a decade within reach, the 48-year-old Hopkins turned his title defense with Murat into a brawl, and retained his share of the light heavyweight championship with a unanimous decision Saturday night. Hopkins walked to the ring in a green mask with black eyes, and a cape, attire straight out of a campy sci fi flick. He had the “The Alien” emblazoned on the green waistband of his black trunks. “The alien don’t get old,” Hopkins said. Hopkins (54-6-2) was dominant in his most convincing — and entertaining — bout in at least a decade. He turned the later rounds into his own personal mission to score his first knockout win since beating Oscar De La Hoya in September 2004 — 15 fights ago. He battered Murat and busted open the challenger with a series of rights to the face to help successfully defend his championship at Boardwalk Hall. Hopkins won 119-108, 119-108, 117-110. Already the oldest fighter to win a major championship, Hopkins wants to keep fighting until he’s 50. Up next, he’d like a date with Floyd Mayweather Jr. in the spring — when Hopkins would be 49. “We’re going to do everything we can to get the biggest possible fight,” Golden Boy Promotions CEO Richard Schaefer said. The Philadelphia fighter also had the crowd on his side, with chants of “B-Hop! B-Hop!” echoing through the arena with each right hand in the late rounds. He also heard encouragement from undefeated Philly fighter Danny Garcia, groomed as the next big star, who screamed “throw that right hand into the body! All day, every day!” from press row. Hopkins, who weighed in at 172 1/2 pounds, pretty much did that as he pounded away at Murat. He smiled and shook his head no after absorbing some blows in the third round. Hopkins kissed Murat on the back of his head coming out of a clinch in the fifth. He also taunted Murat’s corner late in the fight, barking at them to stop the fight.